Halloween is coming! Did you have a plan for what to do for fun on that day already? I know that most of us still wanna do something traditional like dressing on Halloween costumes and going out for party. Then, for those who decide to stay at home or to make some pre-Halloween stuffs like greeting card, voice message, etc, this tip is for you. And, please be noticed that with the voice changer program, you are able to change your voice to different movie characters like Optimus Prime (Transformers) , Yoda, etc. 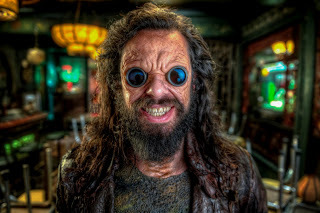 Somehow for the coming Halloween, within this tip, I'd like to present settings for AV Voice Changer Software Diamond to make your voice sound like a Men in Black 3 movie character - Boris The Animal. - On the main panel, click on the On/off (1) button turn on the Voice Morpher panel. - To archive the Boris voice, you can try with Pitch is 59% and Timbre is 115% like per below image. Note: because each voice is characterized on pitch and timbre, it is recommended that you should try more or less to archive your most favorite pitch and timbre parameters to sound like Boris The Animal most. 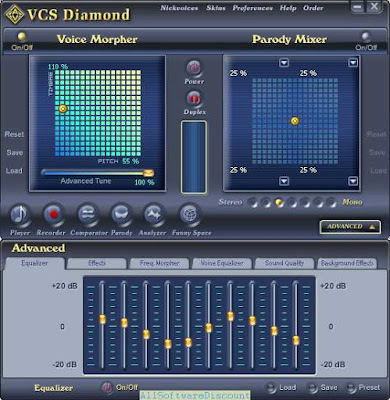 In the next step, you will learn on how to take advantage of some other powerful voice efffects in Voice Changer Software Diamond - the Equalizer and the Effects. - Make change to each slider at a time while speaking into the mircrophone to pre-listening to how you sound like. - The below parameters are recommended. The coming part is very important and you may find that most those special audio effects for Halloween are available for Diamond Edition only. - Check on Tweedledums checkbox of Halloween to choose. The tutorial for Boris The Animal voice is ended here. 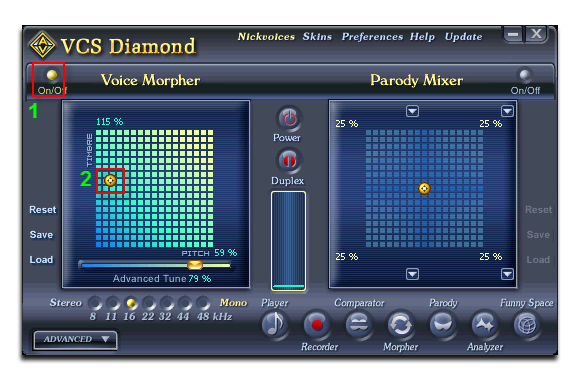 And, another thing we’d want to add up is that you are always able to make it better than this tutorial with your own mix-up audio effects that come with Voice Changer Software Diamond. ** New voice effects and nickvoices updated weekly and free for download at add-ons store .